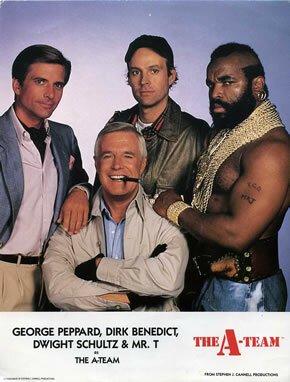 As fans of the A-Team, we contacted the cast multiple times. The first response we received came in the form of an 8x10 black and white photo with pre-printed autographs from each of the four main cast members. Of course, the thrill of one success calls for nothing less than an effort to get more. Our second contact earned us a similar response with the second 8x10 being a color image with the "autographs" on the back. Why stop there? There would be no more contacts sent to the cast at NBC Studios. It was time to pester individual cast members and I'm proud to say we heard back from each of the main guys except for Face (Dirk Benedict). 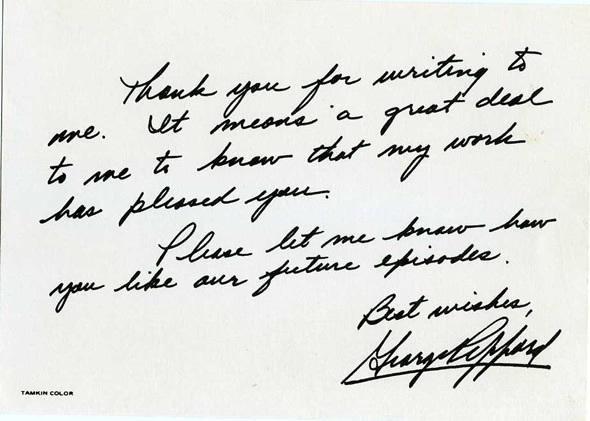 George Peppard's response came in February of 1985. 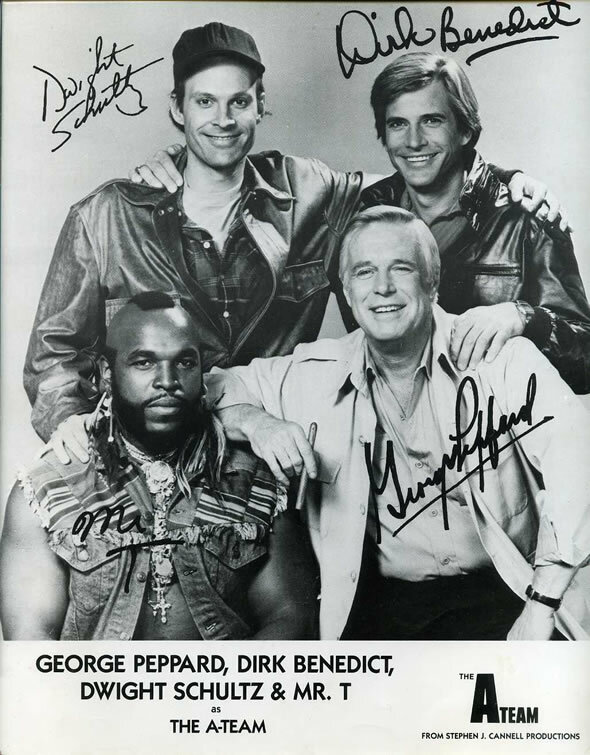 I have always heard that the late Peppard was extremely difficult to work with during his time on the A-Team. Of course, as a kid, all I knew Peppard as was John Hannibal and not the arrogant actor that I've learned of in my adult years. 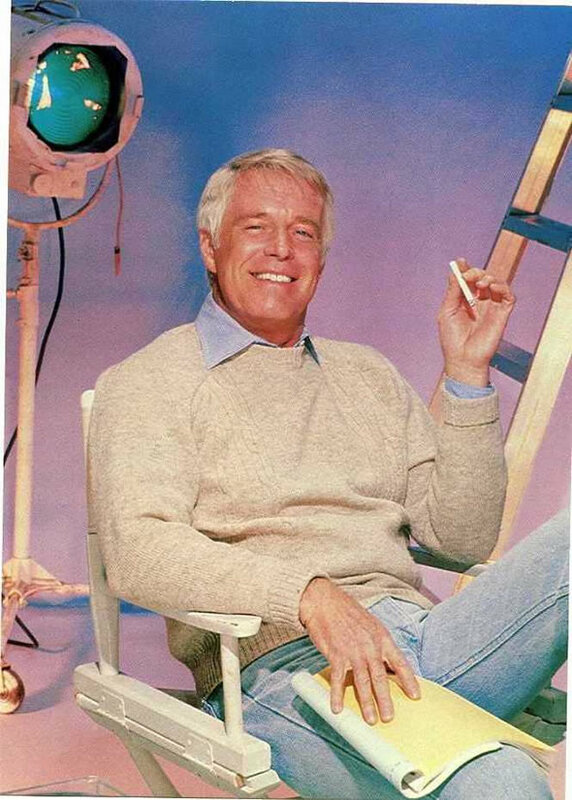 The reply I received from Peppard included a print of him sitting in a director's chair smoking a cigarette with a pre-printed message on the back. The original envelope is also still around. 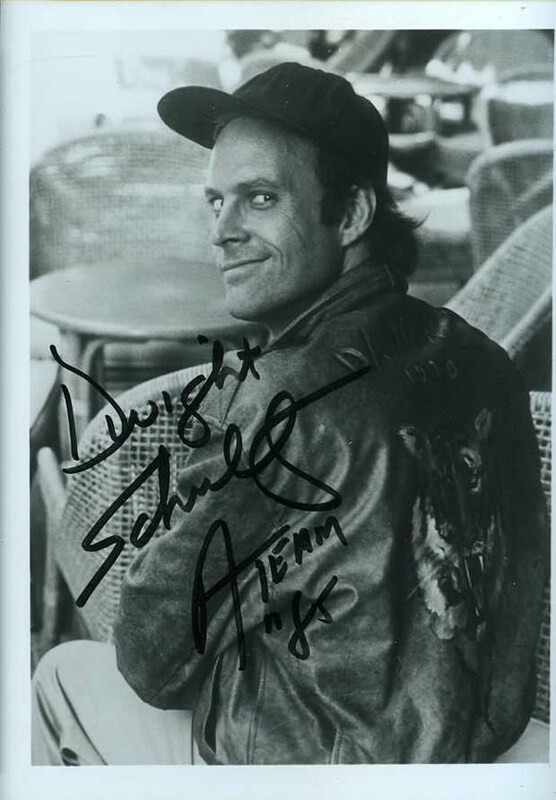 Dwight Schultz was next. 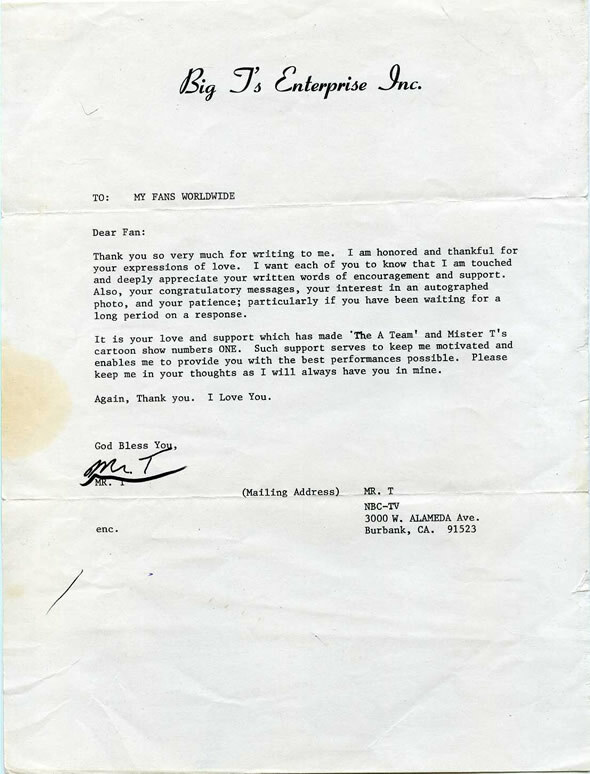 His reply came a month later in March of 1985. 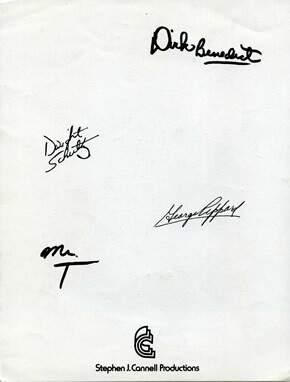 Schultz sent a photograph which appears to be authentically signed. 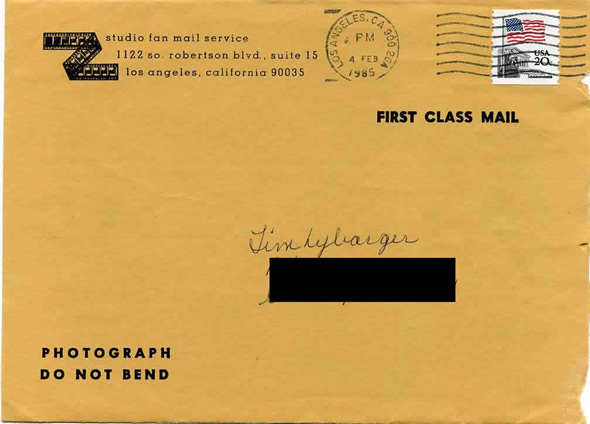 The envelope has a stamp of Murdoch's face in the return address area with the infamous "TIM" stamp next to it. 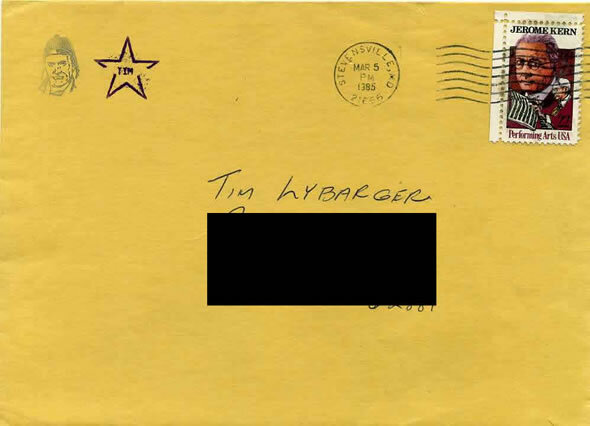 While the Tim stamp obviously came from my hands, I cannot remember whether or not the Murcoch stamp was on the envelope when it arrived or not. I want to say that it was and I felt like my stamp needed to be on there as well. 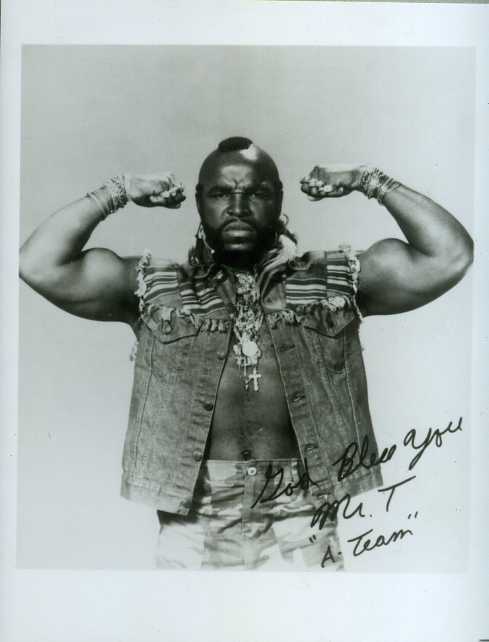 Then there was Mr. T. As one of the most popular stars of the time, it was a bit questionable as to whether or not we would get a response from Mr. T. Sure enough, his company -- Big T's Enterprise Inc. -- responded with a small photo with a pre-printed autograph as well as a form letter from Mr. T.
The line drawn in marker on the letter under Mr. T's name is my doing. Brilliant...yeah...I know. The ones I've shared here certainly aren't for sale but maybe someone will stumble upon this post and have something they can offer you.